A Pastel (UK: ; US: ) is an art medium in the form of a stick, consisting of pure powdered pigment and a binder. The pigments used in pastels are the same as those used to produce all colored art media, including oil paints; the binder is of a neutral hue and low saturation. The color effect of pastels is closer to the natural dry pigments than that of any other process. Pastels have been used by artists since the Renaissance, and gained considerable popularity in the 18th century, when a number of notable artists made pastel their primary medium. Dry pastels have historically used binders such as gum arabic and gum tragacanth. Methyl cellulose was introduced as a binder in the twentieth century. Often a chalk or gypsum component is present. They are available in varying degrees of hardness, the softer varieties being wrapped in paper. Some pastel brands use pumice in the binder to abrade the paper and create more tooth. Soft pastels: This is the most widely used form of pastel. The sticks have a higher portion of pigment and less binder, resulting in brighter colors. 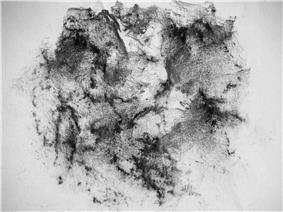 The drawing can be readily smudged and blended, but it results in a higher proportion of dust. Finished drawings made with soft pastels require protecting, either framing under glass or spraying with a fixative to prevent smudging; hairspray also works, although caution should be taken, as fixatives may impact the color or texture of the drawing. White chalk may be used as a filler in producing pale and bright hues with greater luminosity. Hard pastels: These have a higher portion of binder and less pigment, producing a sharp drawing material that is useful for fine details. These can be used with other pastels for drawing outlines and adding accents. Hard pastels are traditionally used to create the preliminary sketching out of a composition. However, the colors are less brilliant and are available in a restricted range in contrast to soft pastels. Oil pastels: These have a soft, buttery consistency and intense colors. They are dense and fill the grain of paper and are slightly more difficult to blend than soft pastels, but do not require a fixative. They may be spread across the work surface by thinning with turpentine. Water-soluble pastels: These are similar to soft pastels, but contain a water-soluble component, such as Polyethylene glycol. This allows the colors to be thinned out to an even, semi-transparent consistency using a water wash. Water-soluble pastels are made in a restricted range of hues in strong colors. They have the advantages of enabling easy blending and mixing of the hues, given their fluidity, as well as allowing a range of color tint effects depending upon the amount of water applied with a brush to the working surface. There has been some debate within art societies as to what exactly counts as a pastel. The Pastel Society within the UK (the oldest pastel society) states the following are acceptable media for its exhibitions: "Pastels, including Oil pastel, Charcoal, Pencil, Conté, Sanguine, or any dry media". The emphasis appears to be on "dry media" but the debate continues. In order to create hard and soft pastels, pigments are ground into a paste with water and a gum binder and then rolled or pressed into sticks. The name "pastel" comes from Medieval Latin pastellum, woad paste, from Late Latin pastellus, paste. The French word pastel first appeared in 1662. Most brands produce gradations of a color, the original pigment of which tends to be dark, from pure pigment to near-white by mixing in differing quantities of chalk. This mixing of pigments with chalks is the origin of the word "pastel" in reference to "pale color" as it is commonly used in cosmetic and fashion venues. A pastel is made by letting the sticks move over an abrasive ground, leaving color on the grain of the paper, sandboard, canvas etc. When fully covered with pastel, the work is called a pastel painting; when not, a pastel sketch or drawing. Pastel paintings, being made with a medium that has the highest pigment concentration of all, reflect light without darkening refraction, allowing for very saturated colors. Only pastels with lightfast pigments are used. Pastel paintings made with pigments that change color or tone when exposed to light suffer the same problems seen in some oil paintings using the same pigments. Works are done on an acid free archival quality support. Historically some works have been executed on supports which are now extremely fragile and the support rather than the pigment needs to be protected under glass and away from light. Works are properly mounted and framed under glass so that the glass does not touch the artwork. This prevents the deterioration which is associated with environmental hazards such as air quality, humidity, mildew problems associated with condensation and smudging. Some artists protect their finished pieces by spraying them with a fixative. A pastel fixative is an aerosol varnish which can be used to help stabilize the small charcoal or pastel particles on a painting or drawing. It cannot prevent smearing entirely without dulling and darkening the bright and fresh colors of pastels. It is also toxic, therefore it requires careful use. The use of hairspray as a fixative is generally not recommended as it is not acid free and therefore can degrade the artwork in the long term. SpectraFix, a modern casein fixative available premixed in a pump misting bottle or as concentrate to mix with vodka or other high proof drinking alcohol, is not toxic and does not darken or dull pastel colors. However, SpectraFix takes some practice to use because it's applied with a pump misting bottle instead of an aerosol spray can. It's easy to use too much SpectraFix and leave puddles of liquid that may dissolve passages of color, also it takes a little longer to dry than conventional spray fixatives between light layers. For these reasons, some pastelists avoid its use except in cases where the pastel has been overworked so much that the surface will no longer hold any more pastel. The fixative will restore the "tooth" and more pastel can be applied on top. It is the tooth of the painting surface that holds the pastels, not a fixative. Abrasive supports avoid or minimize the need to apply further fixative in this way. 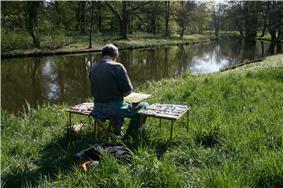 Glassine (paper) is used by artists to protect artwork which is being stored or transported. Some good quality books of pastel papers also include glassine to separate pages. On the Cliff by Theodore Robinson, 1887. A warm beige paper is used as a colored ground to enhance the pink colors. 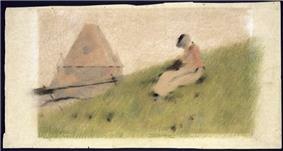 The rough textured ground provided by the paper also enhances the impressionistic style of the pastel work. Pastel techniques can be challenging since the medium is mixed and blended directly on the working surface, and unlike paint, colors cannot be tested on a palette before applying to the surface. Pastel errors cannot be covered the way a paint error can be painted out. Experimentation with the pastel medium on a small scale in order to learn various techniques gives the user a better command over a larger composition. Pastels have some techniques in common with painting, such as blending, masking, building up layers of color, adding accents and highlighting, and shading. Some techniques are characteristic of both pastels and sketching mediums such as charcoal and lead, for example, hatching and crosshatching, and gradation. Other techniques are particular to the pastel medium. Dry wash: coverage of a large area using the broad side of the pastel stick. A cotton ball, paper towel, or brush may be used to spread the pigment more thinly and evenly. Pastels are a dry medium and produce a great deal of dust, which can cause respiratory irritation. More seriously, pastels use the same pigments as artists' paints, many of which are toxic. For example, exposure to cadmium pigments, which are common and popular bright yellows, oranges, and reds, can lead to cadmium poisoning. Pastel artists, who use the pigments without a strong painting binder, are especially susceptible to such poisoning. In the United States, the Society of Painters in Pastel was founded in 1885. The Pastellists, led by Leon Dabo, organized in New York in 1910. ^ a b Martin, Judy (1992). The Encyclopedia of Pastel Techniques. Philadelphia, Pennsylvania: Running Press. p. 8. ^ Martin, Judy (1992). The Encyclopedia of Pastel Techniques. Philadelphia, Pennsylvania: Running Press. p. 9. ^ Martin, Judy (1992). The Encyclopedia of Pastel Techniques. Philadelphia, Pennsylvania: Running Press. pp. 10–11. ^ "Nineteenth-Century American Drawings". Heilbrunn Timeline of Art History. Pilgrim, Dianne H. "The Revival of Pastels in Nineteenth-Century America: The Society of Painters in Pastel". American Art Journal, Vol. 10, No. 2 (Nov. 1978), pp. 43–62. doi:10.2307/1594084. Jeffares, Neil. Dictionary of Pastellists Before 1800. London: Unicorn Press, 2006. ISBN 0-906290-86-4.